Inducted 2000. Volleyball, Basketball Career Flourished at Culver-Stockton. Class of 1984. Wolf’s athletic career at Notre Dame was certainly one to be proud of, but she went on to become one of the best two-sport athletes in the history of Culver-Stockton College. 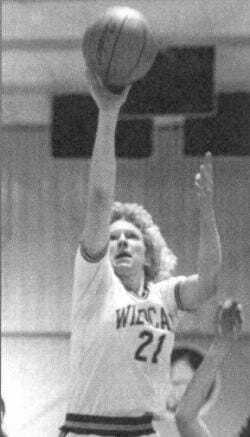 Wolf, a 1984 graduate, was a member of the back-to-back girls baskeball state championship teams in 1982-83 and 1983-84, and her 752 career points rank her in 13th place on the school’s all-time scoring list. She also played on the volleyball teams that placed third in the 1982 Class A state tournament and second in the 1983 Class A state tournament. Her athletic career really flourished at Culver-Stockton. As a member of the women’s basketball team, she became the second-leading scorer in school history with 1,606 points. She finished among the top 10 on the school’s career lists in rebounds, field goals made, free throws made and steals. She also had two of C-SC’s top five single-season scoring marks in her junior (560 points) and senior (544 points) years. Wolf holds career records at Culver-Stockton for kills per game, kill percentage and digs per game. In 1987, she set single season records for kills per game, digs per game and blocks per game. She was twice named to the all-Heart of America Athletic Conference team in basketball and volleyball, and she was a three-time all NAIA District 16 pick in both sports. She was a member of five conference championship teams, and she was elected to the C-SC Hall of Fame in 1999. Wolf and her husband Kevin live in Quincy, and they have two daughters, Rebecca and Katelyn. Wolf is employed by as a branch office assistant at Quincy Medical Group.